For those of you interested in my previous post about planting a Writing Corner in my garden with the idea that as it flourished, so would my writing, I thought I’d post an update. 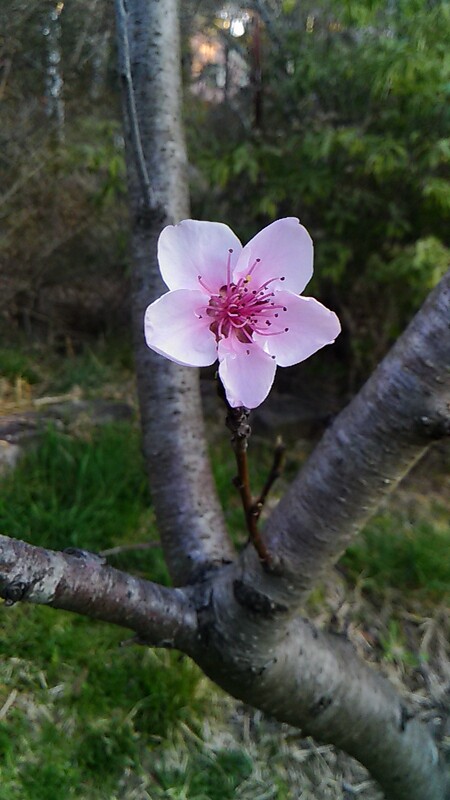 The fruit trees are all in blossom and…Yes! 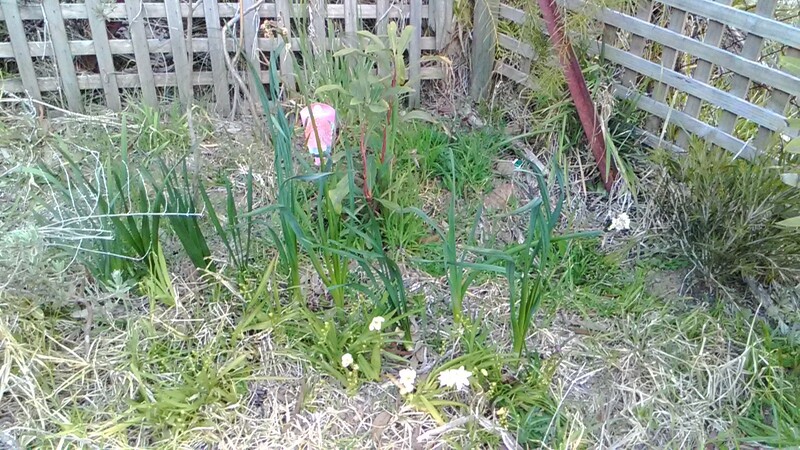 the Writer’s Corner has a healthy Waratah, gorgeous freesias and even the Crepe Myrtle that I thought had died is putting out leaves. The crucial question, of course: Is it helping? I was hoping for a bit more blossoming of productive effort…I may have to wait for the Crepe Myrtle to flower (is that what they do? I have no idea). The workshops have been fantastic, I’m doing the ever-wonderful “How Writers Write Fiction” MOOC with the University of Iowa, I suddenly have a writing buddy and I have been writing but not as much as I’d like. I wanted to publish the first book of The Dragon’s Restaurant for Xmas and that’s not looking likely unless I find some motivation. What has been working is Gratitude. I have recently started saying “Thank You” in the morning when I wake up. “Thank you for another day. Thank you for the opportunity to write and to be a writer.” I’m not thanking anyone in particular, just being thankful. It’s working to the extent that it helps me to remember every morning that I am a writer and to focus on that as my primary purpose in life. As opposed to going to the day job or looking after P who has just come out of hospital again. This time he had a collapsed lung. I have spent two weeks panicking without being able to acknowledge that is what I have been doing. So I’m fairly pleased that in amongst all that I’ve managed to keep up some level of writing effort. “Is it, by Jove?” Says Engadine, brightening up. Perhaps a meal is also like a life: it is only when you describe it afterwards, looking back, that you see the real highlights and know who your favourites really were among the diners, the courses, the flavours. Once there was a pass that led up from the plains around Tara into the mountains. They called it the Little Ravine. The Big Ravine was further South and was much more imposing: sharp granite outcrops stood out against the sky, a rushing river dragged tree-trunks and boulders through it and eight men could march abreast there. But that wasn’t where the dragon lived so it was never as famous as the Little Ravine. If you stand at the bottom of the Little Ravine, there is forest at your back, quite a stretch of it; a belt of mixed deciduous woodland that slowly thins out until it opens right out to become a few scattered trees, mostly oak, on the rolling grassy plains where you can see a dark green pimple with a white dot on top: the tallest tower of the Palace of Tara sticking up out of a mound of greenery. On an ambling horse it takes half a day at least to travel from Tara to where you are standing. You aren’t standing still, you are looking around for dragon-sign. It’s been fifty years since anyone saw the dragon and you can’t see anything to indicate her presence: no huge shadow gliding above you; no fewmets; you sniff, none of that musty old-meat smell; no subsonic rattling noise that will explode into a hungry roar; and most important of all, no talons or teeth. All you can see is a narrow path leading up between mossy cliffs. Broken rocks are piled on either side of the path. It will be slow going, single file, but you set out anyway. You’ve done this before: you know how to climb uphill: set a pace that seems slow now but will last you all day and lets your body have a second to notice if your foot comes down on a loose rock or a snake. Your pack pony follows behind. Around the first corner you stop and the pony bumps into you. It’s a chance to catch your breath while you look at what you’ve found. The path continues upwards, much as before. There are trees growing up on top of the cliffs, so the path is darker now and sunlight arrives in sections, illuminating a fern here, a smooth patch of wet rock there, a cairn of rocks someone built long ago and, of course, the carved weatherbeaten sign that says, “The Dragon’s Restaurant” and beyond that the great pile of fewmets. Droppings. Dragon poo. It coils beside the path like a waist-high dog turd. You approach gingerly and put out one hand. It isn’t warm, which is good, and when you poke it, it crumbles, which is even better. This is old. Years old, decades even. Insects have burrowed into it and hollowed it out so that there is nothing left but an outline. You turn back to the sign and pick at the moss growing in the deep-carved letters. This is old too. You head on up the pass, the pack pony snorting uneasily and stumbling over loose stones. After another twenty minutes climbing in the cool semi-dark you arrive at a fork in the path. You can see the main path ahead of you, twisting its way up and up; and off to your left is a wider, level path made of, you bend to check, crazy paving. A few steps along that path is another carved sign, “Welcome to the Dragon’s Restaurant”. You pick your way along the crazy paving path as it bends between rocks, then trees and then takes you out into an open, grassy glade. You push aside one last overhanging branch and there it is: three storeys of old red brick and oak beams. Congratulations, you’ve found the Dragon’s Restaurant. You stand on the stone path, sadly overgrown with flat-leaved weeds and creeping lichens. Behind you are trees with outdoor tables beneath them and behind that thick forest. The grass is long, scattered with fallen twigs and branches and growing up around the over-turned chairs. To your left is a children’s play area: swings, slide, seesaw and sandpit all sadly rusted and overgrown. To your right, the specials blackboard has warped and hangs out of its frame. No-one has been here for a long time. Surely it can’t be that long? Surely a place like this would have been vandalized by local boys and snapped up by developers? The building in front of you is of brick, those small red-clay bricks that weather so beautifully with age and glow orange and pink at sunset. There are thick oak beams in the walls and diamond-lattice windows. The architecture is vaguely Elizabethan. This is misleading, though, the structure looms against the hillside. A swinging sign, like an English pub sign, shows a dragon coiled around a cauldron and has ““The Dragon’s Restaurant” painted on it in gold. You pick your way carefully along the path, lift the tarnished bronze latch and open the great oak doors. A restaurant must satisfy expectations from the first moment. Over the threshold you step onto a stone floor in a room whose walls are criss-crossed with wooden beams. Wooden tables, wooden chairs, wooden window seats under the diamond-latticed windows and a huge stone fireplace. The arrangement of the tables and chairs is pleasantly cosy but the ceiling lofts above you like a shopping mall. There is room in here to grow trees and high up in the wall a huge hole lets in the light and, presumably, the weather. Not so cosy, then. At the rear of the restaurant you can see natural stone – the hillside is scooped out into a cavern. It is dark back there and rats scuttle around. Hmm. The rugs on the floor are a little mouldy from the damp and dead leaves crunch underfoot as you cross the room to where a grand piano waits. You lift the dusty lid and try the keys. The notes jangle out of tune and uncared for. A book lies open on top of the piano. You close it to look at the cover: The Second Book of Household Hints. There are stains on the floor. Big dark stains, too big to be the result of food spillage. Curious, you kneel down to sniff them. You taste a salt tang in your nose: old dried blood with an underlying note of decay. Things die here. You have a tinderbox in your pocket, so you light one of the candles and head for the darkness at the back of the restaurant. There are more tables here, arranged around a dancefloor, but the candles on these tables are stuck onto, you shiver, human skulls. Further back in the cave and your feet crunch on something. You lower the candle to see. Bones. You aren’t sure, but they look human. You pick your way across all those bones and spend the rest of the day exploring the tunnels that lead off the restaurant. You find human-sized sleeping quarters and a kitchen that is large but not, you think, dragon-sized. You finally find the inner cavern, definitely dragon-sized, and the reason for your journey: treasure! Except that any treasure there might have been is long gone; robbers braver than you came here long ago and only left a few scattered brass ornaments. You poke around for a while to see if there is another cave but that seems to be it.Your candle flickers; it’s only a stub now and you head back to the restaurant. And try your luck again! While you sit by your campfire tonight, knees burning, back freezing, ears tuned for creeping predators, I’ll tell you the history of the restaurant, if you like.